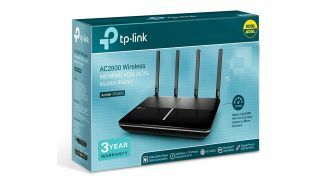 Amazon has continued to cut prices on a variety of products in the run up to Black Friday, and today it's offering up to 35% off certain TP-Link Archer routers. The TP-Link Archer series of routers are impressive bits of kit - we've reviewed a fair few - so there's some tempting deals to be had. It's worth noting that these are part of Amazon's Deal of the Day promotion, which means they are only on sale for today, 15 November, only. That means you'll need to buy by 11:59PM tonight if you fancy any of these deals. This is a fast modem router that replaces the free modem your ISP gives you, as long as you use a phone line (BT, TalkTalk, Vodafone). It offers fast network speeds and wide Wi-Fi coverage and is £44 cheaper for today only. The more affordable Archer modem router gets a £20 price cut. It's not as fast as the router above, but still offers some great features including a VDSL/ADSL modem for phone line connections and USB port for sharing devices over your network. If you've got a cable internet connection from a service like Virgin Media, then this is a great Wi-Fi router that's now more affordable thanks to a £14 price cut. Features 5GHz and 2.4GHz bands, has four LAN ports and guest Wi-Fi functionality. Remember, these deals are only live for today November 15 and end at midnight tonight.